Pet strollers aren't a necessary product that every owner needs to care for their pet. 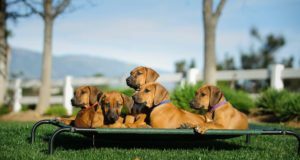 However, they can be a great tool that allows you to bring your dog with you on long hikes, runs or walks. The VIVO Four Wheel Pet Stroller is much more affordable than many of the other models on the market, which is what piqued my initial interest. I wanted to test this stroller to see if it would stand up to my rigorous testing. A cheaper price tag is always great, but if the quality of the product suffers then it still isn't worth paying for. All in all, this is a good stroller for the price. 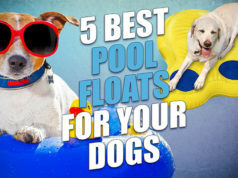 It's ideal for pet owners who will only be using it occasionally. If you're looking for a stroller to take on your daily jogs, this one probably isn't going to hold up for more than a year or two. Let's talk about the specific details of the VIVO Four Wheel Pet Stroller, and why I came to this conclusion. Many dog strollers sell for upwards of $100. Thankfully, this stroller is affordable for dog owners on any budget. At just $48, VIVO had me wondering whether or not this stroller would hold up as well as more expensive brands. There's plenty of mesh panels that provide ventilation and visibility for your dog. This is a great feature for pets that have a bit of anxiety about riding in a carriage. Some strollers offer easy-to-open clasps, but the VIVO Four Wheel Pet Stroller has to be unzipped to open. Zippers are common pet strollers, but they are inconvenient if you have a wiggly pet. It's hard to hold a squirmy dog in one hand and try to unzip a stroller with the other. I also like the small window located on the top of this stroller. 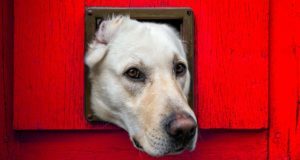 You can quickly peek in on your pet without disturbing him. As I demonstrate in my video review, there are breaks on all four wheels for safety. This stroller also features a cup holder, snack tray and a large storage compartment underneath the carriage. The best thing about the VIVO Four Wheel Pet Stroller is that it folds flat for easy transporting. In the video review above I demonstrate how easy it is to collapse this stroller. All you have to do is pull up on the latches located on either side of the frame. The stroller folds flat and then can easily pop back up with a quick pull. You'll definitely want to look for a stroller that collapses if you plan on taking it with you in the car or while traveling. And, at just 13 pounds this stroller is ideal to take along on an airplane or outdoor adventure. Finally, let's discuss the strollers function. It's lightweight, so it pushes very easily. The wheels on the front turn 360° to make maneuvering the VIVO Four Wheel Pet Stroller a breeze. I did not like how difficult it was to push this stroller through mud or over rough terrain. When you pair the cheap wheels with the light weight of this stroller, it makes it very difficult to push when the path gets rough. 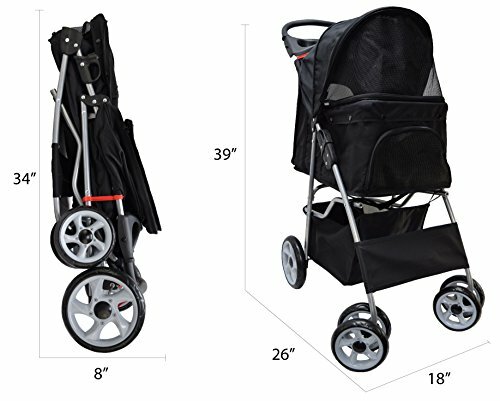 Higher quality, more aggressive wheels would be a great addition to this stroller. The good news is that it doesn't weigh a lot, so it's not difficult to pick up and carry over obstacles. The price of the VIVO Four Wheel Pet Stroller varies depending on the color you choose, and it's available in 7 different styles. They run about $50 on Amazon, with black being the cheapest ($47.99) and red being the most expensive ($51.99). The VIVO Four Wheel Pet Stroller can carry up to 30 pounds of weight and offers plenty of storage room. The front wheels turn 360° for easy steering, but it's not the best stroller to use on rough terrain.